Rollkur? Deep? LDR? Forward-Down-Out? Long & Low? Behind the Vertical? German dressage rider training 'deep'. What does "rollkur" (rollkuer, rolkur or roll cure) or training "deep", "round", "LDR" (Low, deep, round) mean, and what is it supposed to accomplish? 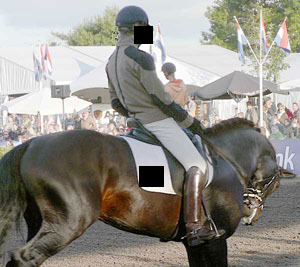 Many dressage riders and trainers have a sort-of understanding of it, knowing that Olympic champions use this technique, and that yet others speak out strongly against it, usually in terms such as animal abuse, coaxing, force, shortcut, unnatural, ignorant, destructive, the list goes on. But what is it? It really depends on who you ask. The first dressage rider in our time "revealed" training her horse using this technique was Germany's Nicole Uphoff, when a photographer had sneaked into her indoor arena and photographed her riding Rembrandt "tief eingestellt" - deep. German dressage rider training deep in 1994. When the photographs were later published by St Georg Magazine they wreaked havoc in German horse media. Nicole and her trainer Harry Boldt denied that she had intended that position in her horse at all, and said that it was an "extreme exception". "It was an extreme exception. Rembrandt shied for fences erected at the end of the arena. The fact that Nicole curled him down so extremely deep was only for correctional purposes." - note lack of bending in the haunches. "Any training method that leads to success in the show arena must be correct and therefore classical." Rollkur? Deep? Long & Low? Forward-Down-Out? Curled in behind the vertical and low-ish. Training the horse deep involves the lowering of the head and neck below the height of the withers and/or placing the head of the horse with the nose behind the vertical, curving the neck accordingly. So the horse needs to have his nose significantly behind the vertical, but not necessarily the neck very low. Those practising deep like to call it Deep or Round, while those who shun it call it rollkur. (The derogatory expression comes from the German Rollkur which was a stomach remedy that one would drink, and then roll on the floor for it to coat the inside of the stomach.) The term was coined by German horsemagazine St Georg. Neck curled and bent grossly to the sides at medium trot. 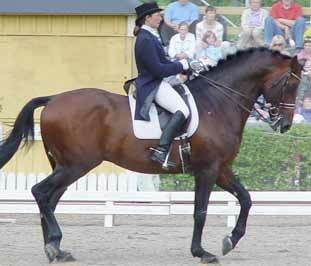 Not only are some dressage and jumper horses trained extremely curled in behind the vertical, they are usually also grossly bent to the sides, preferably during medium gaits or during rapid changes of direction and gaits. The bending appears to be mainly at the lowest cervical vertebrae, setting the whole rest of the neck to the side. Sometimes, but not always, the horse is also positioned at the poll. Overbending vertically and laterally (as a demo). In more traditional training methods the neck should never be more laterally bent than the rest of the horse's spine, to keep a working alignment of the vertebrae, to keep check of the shoulder, to keep the horse in balance and to keep the base of the neck steady and usable as a lever for managing the back. 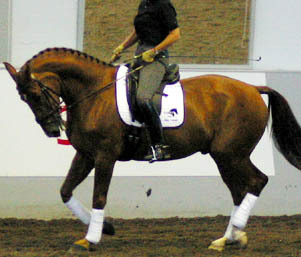 In rollkur, it appears that riders purposefully bend the neck to the sides in exess, to disengage the base of the neck, or to make it harder for the horse to resist. Proponents explanation range from suppling, stretching, and bending to disengaging the hindquarters(?) or "taking the neck out of the training". Rollkur, Deep'n'Round and LDR should not be confused with letting the horse stretch Forward-Down-Out, chewing the reins out of the hands of the rider, seeking contact with giving reins. That kind of stretching was never intended as a training outline as such, but a mere control of the horse's seeking contact and letting the horse volontarily stretch, and to be allowed to relax for a moment, and stretch the back, in relaxation. 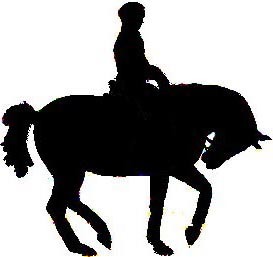 It does not involve any placing of the neck by the rider since the horse is left to himself to stretch down naturally. This position approaches the grazing position, and has the same effect on the back. forward-down-out, which is really a curl. Many writers, such as prominent judge Eric Lette, describes the Forward-Down-Out all wrong in his book Dressyr. Unfortunately, this book has been standard reading for Swedish dressage enthusiasts for many years. There are two photos of his mount in trot, one depicting "up" (which is only a tad behind the vertical, splenius muscle bulging) and the other is depicting "down" with no stretch at all and virtually the same rein length. The horse shows no stretching out of the neck, only a curling of the neck by the use of the underneck muscles. This is not forward-down-out nor is it a stretch. It is a curl. Horse curling behind the bit avoiding contact. It should not be confused with trying to ride a horse normally, that has learned to evade contact and curl Behind the Bit, and failing at getting the horse to stretch. Those riding deep/rollkur do so with intent, and not because the horse happens to curl behind the bit, at least in training. In showing a lot of the horses fail miserably at stretching into the bridle, so instead the rider must shorten the reins. Those practising just riding their horses overflexed and behind the vertical are usually totally uninformed about the fact that that's no state in which to show a horse in a test, nor to train a horse for a test. They simply ride like that whenever and always thinking that their horses are on the bit and through, since the nose is in. Overflexed at the 3rd vertebra and face behind the vertical. They know that the nose should approach the vertical, but they apparently don't know that less is more - that the nose should be at the vertical or in front of it because the horse reaches for the contact, not that the head should be "held back" into a "on-the-bit position". They think that the horse should give in to rein pressure and hang his head on the reins and "make contact". They don't know that it is not very good biomechanically, and not a way to ride a horse, be it in training or in a test. It's a crude way to change the contact from being above the bit, to make the horse give in and to keep him there - not much tact and feel is needed. And apparently no knowledge of the horse's anatomy enters the picture. Warming up deep in 2005. But since it is not one method, but several with common goals, all famous riders who practice it do it differently when it comes to depth, curl, bend, contact, demands, extent, aids and auxiliary equipment. Most of the proponents say they don't use drawreins or similar, because "you don't need it" because the horse cooperates and wants to do it, etc. But someone video filmed a famous Dutch trainer riding one of their horses VERY deep and in a double bridle and a very short gogue! I don't suppose that he gets off every 5 minutes to let the gadget out to give the horse a rest from the curl? If it had at least been drawreins, he could have argued that he let the neck out frequently, since it's possible to let them out manually. Riding in a double bridle AND a short gogue! This was all broadcast on TV in a messy affair to try to prove that this training method resulted in the sudden death of another horse in their training. Personally I don't think you could ever prove such a thing. Horses can drop dead for a lot of reasons, just like people. But it did cause quite a stir, since the new owners were connected to some kind of sponsoring, as well. Some kind of settlement was reached. But this idea of training horses by bending their necks in different directions is not new. In the 17th century the Duke of Newcastle, William Cavendish trained horses for the rich and famous, alledgedly overbent, and forcefully so. He is reputed to have invented drawreins. The truth in this, we will of course never know. In 1842 Francois Baucher published his "A New Method of Horsemanship (Méthode d'Equitation basée sur de nouveax principes)" where he explains how to "eradicate all resistance in the horse" by great flexions, twisting and bending the neck of the horse. He claimed to train the airs in a matter of months, and attracted both followers and straunch critics. Baucher was followed by James Fillis who in his turn forwarded all his knowledge to the Russian army, and one can se traces of that in the flexions used by Russian riders today. He also started the tradition of flexions during movement, which rollkur proponents use. At the turn of the century Paul Plinzner, a student of Gustave Steinbrecht, trained horses for the German Kaiser, who had the handicap of only being able to use one of his hands. The Kaiser felt safer on horseback when the horse was overflexed and controlled by sharp bitting. In the 70's, Alwin Schockemöhle had great success on horseback, but in the jumping discipline. He rode his horses totally rolled up using drawreins, and had no second thoughts about riding over fences in this manner. 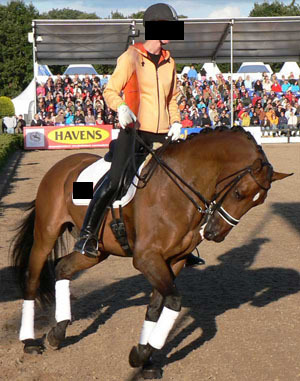 In modern times Isabell Werth (and the others in training by German Dr. Shulten-Baumer), Nicole Uphoff, and Anky van Grunsven together with her trainer Sjef Janssen represent the ideal of riding horses deep. Out of these, Grunsven and Janssen are those who are the most open and honest about their training theory, speaking about it in interviews and articles, and absolutely those who attract the most students from the world of dressage. Many are drawn to the friendly and happy couple and want to learn the technique that can take them to the Olympics. The openness around the method has increased significantly since 1988, when Nicole Uphoff won the Olympic gold medal. Since then, the vast majority of horses winning the Olympic gold have been consistently and routinely trained deep. The rest are ridden more or less overflexed or forcefully up, and are in no way near the performances of the deep trained horses, when it comes to control, precision and frontleg pizazz. The main aim of all those employing this method of lowering and curling the head and neck of the horse is said to be to get the horse to raise the back and swing it. For the horse to develop the backmusles correctly they need to be working in a relaxed state and not a shortened cramped state, like some horses start out the riding session. "Engaging in this sport, once dominated by male riders, are now women and young girls who need "rideable" horses. Complicating for the ladies is the fact that the trainer may not ride the horse in the warm-up. If for example Rembrandt or Grand Gilbert does not release the back in their work, then the half-halts will not go through. "One can only build and strengthen the back if the horse is supple. The fact that Remmi or Grand Gilbert don't show any resistance in the neck, poll or quarters is only due to them having been losened deep and round. Not until all muscles are supple can a horse show top performance and enjoy his work, because everything is simple. As short and deep as those photos portrayed, is, of course, no solution. But having the nose behind the vertical is not tragical - the girls can at any time pick the horse up. They keep the connection to the bit at all times. The advantage of the method - the horses bring their heads down, the back comes up and starts to swing so the horses can be trained in utmost relaxation." Reiter Revue 2/92 "Von der Rolle"
Lowering the necklifts the back under the saddle. By bending the neck down, the back is bent up, and by tightening the abdominal muscles the back arches like a bow. This raises the back, relaxes the back muscles and the back starts to 'work'. As the horse moves forward at trot or canter, he does so by smaller or larger leaps. 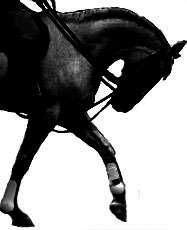 In trot there are two leaps per cycle (one for each diagonal) and at the canter there is one. This makes the whole mass of the horse move up and down with the leaps. The horse consists of 57% trunk (The McPhail Chair Report #10) and this trunk consists of the viscera and chest, suspended from the spine. 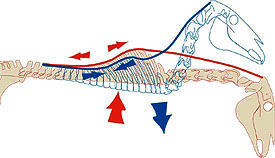 The spine and thorax in their turn are suspended between the forehand (shoulders) and the hindhand (pelvis). The mass of the trunk and the forces on the spine in different phases of trot. 57% of a horse of 1200 pounds = 684 pounds. If a rider is added on top of this that makes 684 + 120 = 804 pounds. 804 pounds ejected into the air 2 - 6 inches in every leap of the trot. 804 pounds landing, coming down from there and caught by frontlegs and hindlegs. Considerable forces are involved. One force pulling upwards on the spine as the horse's mass turns in the air, and a much greater force pulling downwards on the spine at landing. These forces alternate throughout the cycle, pulling up, down, up, down. Since the force down is far greater than the force upwards, this needs to be counteracted some way. If not, the spine would hollow, wear, give, bend and break, sooner or later. But the spine is in itself slightly arched upwards (Schrijer, Dressage Today Nov 2003), to counteract the forces, much like a roman bridge. To keep this arch, to aid the ligaments between the vertebrae, and to stabilise the viscera, alternating abdominal/iliospoas muscles and back muscles are used. Stabilizing the mass of the trunk in different phases of trot aided by abdominal muscles and back muscles. The iliopsoas muscle group in collection. Now, the muscles of the pelvis/lumbar region are greatly involved in this. But the reason hardly any riders know about them, is because they are located inside the horse's body. 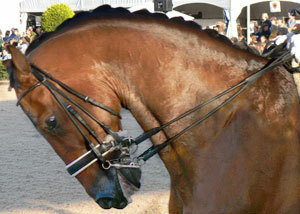 They cannot be seen from the outside (Solange Schrijer - How the Horse's Back Works, Dressage Today Nov -03). They attach at the last 7 vertebrae of the lumbar spine and the bottom of the pelvis (psoas minor) and from the last lumbar vertebrae to the mid-section of the thigh bone (iliopsoas muscle). The mass of the iliopsoas inside the body of the horse. These muscles, The Psoas-Group, are extremely strong, and have almost as much bulk as the muscles along the topline of the back (see cross-section right). They aid collection by rotating the pelvis and advancing the hindleg to land well under the horse. They work together in rotating the pelvis (Psoas Minor) and advancing the thigh (Psoas Major, Iliacus). When supported by the abs, these are very powerful muscles for "using the back" and keeping the rounding of the topline (Solange Schrijer - How the Horse's Back Works, Dressage Today Nov -03). We do not want the back to be arched mechanically, constantly and stiffly upwards, by static, permanent muscle use. (Der Reiter formt das Pferd by Udo B�rger). We only want it to lift and undo the sag that we as riders create when we sit down on the horse's back - We want the back to relax, let itself be lifted, and the abdominals to tighten intermittently so that the back will not dip each time the horse lands from a step and the mass bears down together with the mass of the rider. Riders employing rollkur generally say they don't force their horses with rough hands or drawreins. Maybe that is not always needed when the horses are mostly trained with double bridles and crank nosebands, anyway. 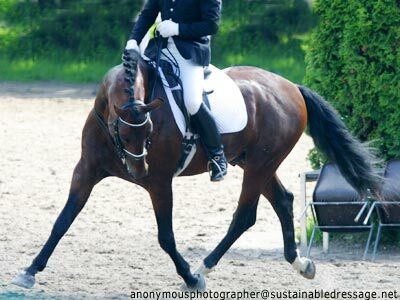 The curb goes a long way, especially if you pull against your stirrups! But what you can do to gain control, is trap the horse. When a horse is asked to put his head so low and curled in, it takes such a shift of muscle use, balance and engagement, that to simply put the head up takes several steps. In that time the rider "half-halts" or nudges, pushes the horse sideways or bends or turns or something to distract, and the horse is deterred from upping his head. Joint lock between 2nd & 3rd vertebrae. The extreme form of overbending where the joint between the 2nd and 3rd vertebrae of the neck is at the very end of its range of motion, works in the same way as a policeman's grip around the suspect's arm, threatening to dislocate it or cause pain unless the suspect complies. The neck of the horse is very agile and a lot of nerves and reflexes are located in the conntective tissues to ensure that the spinal cord running through the vertebrae is not harmed. Imagine yourself with the arm behind your back, and the person holding it there says "-Dance!" This type of "joint lock" triggers those reflexes, just like in the suspect's arm. With this grip, one can ask as politely as one likes, and still always get a "yes, Ma'am", wether it be for "come along here" or "piaffe!" Ridden Up & In rather than Deep & Round. In an interview in Reiter Revue (3/1994), Nicole Uphoff said she never used drawreins. She's too proud for that. Instead she explains that if a horse is put deep and still does not want to yield or wants to lift the head, he is put deeper still. As a matter of fact, she explains how her horse Freudentänzer had to be successively "taught" to go deep lunged in vienna sidereins, with her out of the saddle for 9 months, before he was able to go as deep as she thought fit. In the case of training Up and In (see A Different Theory of Dressage Training - Grunsven/Janssen) which we have seen striking examples of on the web (and if not, here's a link to the video file www.saddletude.com/bbdressage.html Click on Anky Warm-Up) the horse is held in this position, which is neither long nor low. It's compressed. The horse has no chance of governing his own balance. 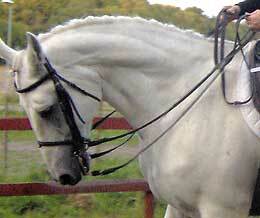 Plus the double bridle. "He has a natural way of stretching out his neck by himself, and not waiting on us - so we make him a little too short, and totally on the rein, to make him wait - so that he learns to stretch our way, and to our contact." Another thing about asking the rear end of the horse to arch the back (other than that real collection comes from behind and thusly arches the back) is that the rider cannot make the horse bend the back up - he has to ask. The horse must be a willing participant in this, and can readily protest against loss of balance, fatigue or anything, really. When the head is bent down, arching the back is mechanically induced, unless the horse objects by shifting his balance to raise the head and fight the hand and curb bit, or by rushing. When the hindlegs are asked to step under and arch the back from behind, each step is a generous granting of the rider's wishes by the horse, not a surrender of power and balance to a demanding superior. When a horse has been trained to keep his head down, no matter how much he loses balance, how tricky something is or how interfering the rider is, that horse scores better in a dressage test, compared to one ridden on the fine line between collection and liberty. That is because the horse ridden "at liberty on parole" occasionally shows his momentary loss of balance by throwing his head up. A rollkured horse has learned that opposing the rider will not improve his situation, to put it mildly. Over-bent + over-tempo, leaning in to counter centrifugal forces. There are horse breakers, or re-trainers, that lunge difficult horses with a sack over their heads, and slack the line until the horse steps on the line or gets caught with the frontlegs, and falls. Then they rush over and sit on the horse's head. The horse in this situation, can do nothing. He learns that he has to surrender the responsibility of his life to the handler. The horse gives up much of its flight instincts. Often this is used as a last resort with horses whose trust in humans is completely gone. It's that or the butcher, for some ruined horses. It would be crude to compare rollkur to such a method, but it has similarities. The horse is physically hindered from correcting his own balance and being in charge of his way of going, so that he sooner or later learns to submit to the rider, and to take the losses of balance and the over-taxation in his stride because he is unable to do something about it. Sadly, many judges don't seem to notice loss of balance as long as the head stays down. Or if balance is on the forehand as a rule and not an exception. One of the major advantages of this method is that it gives a very manageable horse in the competition arena. You get a horse that agrees to go on the forehand and not lean on the hands or throw up his head when he loses balance or gets tired. At first glance, everything looks to be going rather smoothly, and "balance" never fails, and suppleness and submission clearly shows in the consistent "giving" to the riders aids. But when a horse's poise is compromized this way, he will suffer loss of balance, probably even more frequent than were he to hold his head and neck more naturally. He will just learn to lose balance, and not react on it - not throw his head up, not lose rhythm, just plow on through. Many of the more finely-ridden, but rollkur-trained horses, don't swish with their tails much, don't make "funny faces" all the time, and seem quite at ease in their emotional expressions, while in the competition arena. This, one could argue, is because they actually find it easy to do things with the head in a normal position and to be able to use the neck some. Compared to how they are usually trained, showing off in the test is a piece of cake! Who knows how much they swish during training at home? Not necessarily related to rollkur, but rather to competition riding in general, several test have been made of the level of anxiety in the horse at home during training, compared to away at competition. Contrary to what one would believe many horses were more at ease in the competition arena than at home schooling. It was speculated that the horses didn't fear correction/punishment in the competition arena, but probably did at home. They had learned that if something goes wrong away at competition, you don't get to try to do it over and over again, like you would at home, training. The Grunsven/Janssen team explain in interviews that they use LDR (laag diep rond) to make things harder for their horses. In an interview, they say that if you train a horse to do things much more difficult than those shown in a test, the horse will flow through the test when in the ring. If you train the shoulder-in, but instead do it deep, with the chin at the shoulder and at medium trot, the horse will "dance" through the regular shoulder-in, in the test, because it's so easy in comparison. This is a means to push the limits, and then some. My say is, that if you teach a horse to do movements out of balance, the horse will accept to do all movements out of balance in the competition arena, without argument or showing opposition. And doing tricks out of balance without resistance, can fool anyone to believe that things are going great. Even judges. Dressage is a dialogue between two participants that need to understand each other to be able to practice and improve, to work together in harmony. The horse is dependent on the rider's aids and signals to know what to do, and the rider is dependent on the horse's feedback to be able to adjust his aids to correct the balance, engagement, suppleness and fatigue of the horse. The rider painstakingly teaches the horse to respond to the aids in a certain manner, and the horse painstakingly learns to do so. But in order for the rider to be able to know and plan how to train his horse moment by moment, he must feel how the horse responds to the aids, movements and exercises with balance, engagement, suppleness and when he gets too tired. That way, coming above the bit or seeking support in the riders hand can be a signal of loss of balance, loss of engagement, stiffness or unease, and can be very useful information to the rider. Good balance, arch and collection without rollkur. This information can only be obtained if the horse is free to express it, by riding the horse "At Liberty on Parole". By riding the horse in an outline where he must be willing to comply instead of trapped in an outline where he has no choice but to surrender to demands. Klaus Balkenhol says it's somewhat easier for the rider not to lose the back when riding overbent, and that that appeals to riders who want to be comfortable and lazy. But also that the expense usually comes as lack of engagement and responsiveness. He rightfully claims that it takes a lot more alertness and thinking to place the poll as the highest point. "Often the rider will notice more evasions (riding in front of the vertical and up) but these evasions present a rider with information. Perhaps the horse is unsteady because he is tired and needs a break. Perhaps the poll can't be the highest point because of lack of engagement. Maybe there isn't enough back-to-front connection over the topline." Regardless of whether or not you allow the horse to show loss of balance/engagement or unease/fatigue, he WILL suffer it. It is just less likely that you as a rider will know, since the horse has been muted. The dialogue has become a monologue.